Ukrainian designer Alesya Kasianenko has created a concept idea for a bedroom that includes building the bed into a wall lined with cabinets. 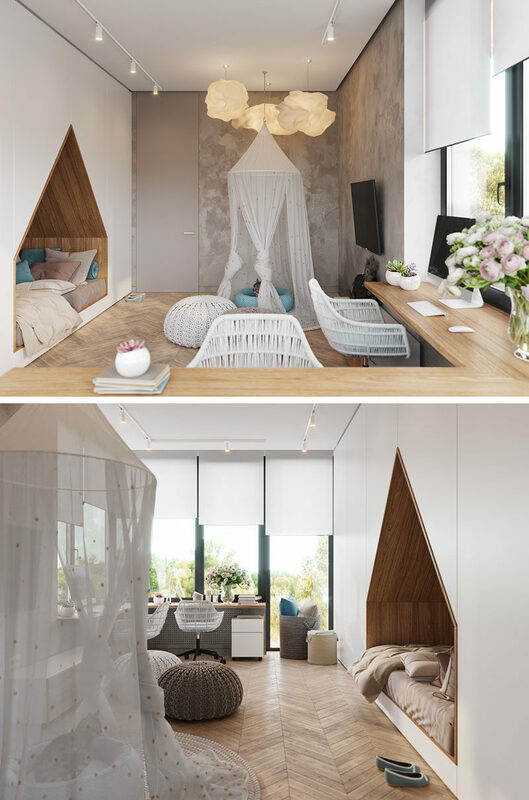 The bedroom, which has corner windows, has been designed so that a wood desk installed under the windows is positioned to take advantage of the view, while poufs have been included for sitting on the floor. Along one wall of the bedroom are floor-to-ceiling white cabinets that provide ample storage, and as part of the cabinet design, a portion of it was cut away to create a wood-lined nook for the bed to nest into. The nook also takes on the shape of a house, allowing the person resting to also use it as a couch when watching television.